As you know one of the largest and most buzzed about annual fashion events in existence has finally arrived; the Met Gala. The Metropolitan Museum of Art Costume Institute Gala often results in the most memorable and noteworthy fashion happenings of the year. There’s plenty of opportunity for a moment such as those ones with this years theme, “China: Looking through the glass”. Most notably, Rihanna shut the red carpet down with her jaw-dropping ensemble. In fact I expect us to still be talking about this for years to come. 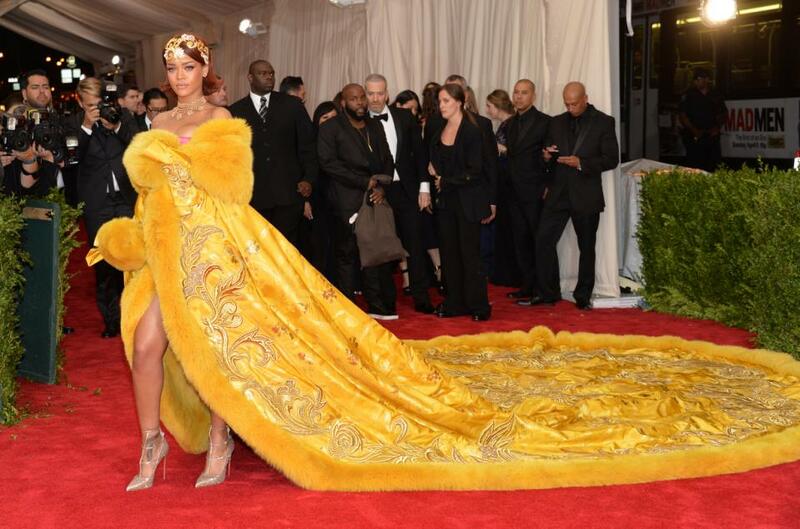 Rihanna’s cape has nearly everyone speechless, not to mention the fact that she has a whole three people assisting her fabulous train. She’s wearing an outrageous fur trimmed yellow cape with impeccable embroidered floral and swirl detail created by Chinese designer Guo Pei. What we don’t yet know is just what she’s wearing under that beautiful cape, or if there even is anything under the cape? From head to toe Rihanna is looking absolutely flawless. Each and every detail in her look was done so tastefully from her beautiful headpiece, to all her jewelry and of course the sparkly Louboutin heels. I’m not sure if we should even be surprised, after all Rihanna has a tendency for leaving us all speechless. Stay tuned for more fashion updates from this years Met Gala.